A star just exploded nearby, in one of the galaxies in our “Local Group.” It’s all relative, of course. The galaxy, M82, is about 11.5 million light years away, so the tiny dot that is the supernova is light that left M82 right around the time the Amazon River was forming, and long before people existed. It’s humbling to think about, which is one of the reasons I love astronomy so much. Your own life is so fantastically insignificant in the big picture that it staggers the imagination we care so much about it. Many people think that the reason we’ve never encountered intelligent life from other planets is that supernovae like this one have wiped them all out over time. Possible, I suppose. It’s as good a guess as any I’d have. Another reason for humility at our plight here on this little rock orbiting the sun. 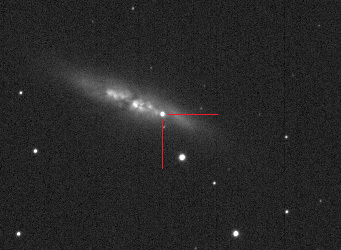 Big questions, but right now the biggest question for me is how many cold nights I can take looking at the supernova. I saw it tonight, and it’s clearly visible, lighting up the little blur that is M82, far brighter than all the billions of other stars in that galaxy…combined. It’s an amazing universe, and all we need to do to see that is look up.